Part of this psalter was formerly bound between two apparently unrelated texts in a manuscript in the Royal collection; other leaves, which were formerly used as scrap parchment in bindings in the Cotton collection, and have now been reunited with the Royal portion. 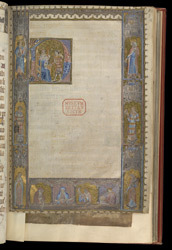 The choice of saints in the Litany suggests that the psalter was made for use in the North of England, and the illumination relates to a manuscript associated with Elizabeth de Bohun, Countess of Northampton, and a church in Shrewsbury. The Psalm 52 initial 'D' contains a Fool before King David. The border includes (clockwise from upper right) Sts. Edmund, Stephen, Catherine, four prophets, Mary Magdalene, Lawrence, and a king.